(4:55 p.m. EDT) -- Francesco Schettino, captain of Costa Concordia, spoke at a pretrial hearing October 18, where he said many people share responsibility for the accident that claimed 32 lives. Speaking for the first time at the hearings, Schettino said he was to blame for steering the ship into a rocky area in waters off the coast of the Italian island of Giglio, according to Reuters. 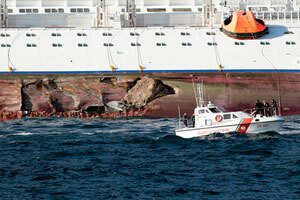 Still, he said the incident would have been more disastrous had he not steered Concordia toward shallow waters. Schettino is accused of causing a shipwreck, abandoning ship before all passengers debarked and 32 counts of manslaughter. Eight others, including crewmembers and Costa's crisis coordinator, also are under investigation. None have been charged. The pretrial hearings, which aren't open to the media, are being held in Grosseto, Italy. They will determine whether anyone will be indicted and were expected to conclude October 18. A trial isn't likely until 2013. At the hearings this week, expert witnesses testified about onboard equipment issues and Schettino's actions. Experts said several crucial pieces of equipment, including the sonar depth sounder, were turned off at the time of the January 13 accident, according to Reuters. In a statement October 18, Costa lawyer Marco de Luca said, "There are no objections concerning possible co-responsibilities by the Costa company as to what happened. The pretrial hearing confirmed this situation." Costa Crociere continues to place the bulk of the blame on Schettino, saying it was the captain's duty to properly notify Port Authorities of what happened to Concordia. "The master of the ship is responsible for every decision he makes," de Luca said October 18 in a news conference outside the theater in which the hearings are taking place. He criticized Schettino for saying his subordinates were also responsible.